This year’s Literary Festival takes place Wednesday, November 28 through Saturday, December 1. The Literary Festival is comprised of visits to the local library, talks by incredible authors and writers, a pop-up bookstore, and a special Literary Festival Kuyam. The many Literary Festival activities are designed to celebrate and encourage a love of reading and writing; this festival promotes a passion for reading, inspires our students to take ownership over their literary creativity by seeing themselves as authors, and instills a culture of visiting libraries and bookstores. Each year, our committee brings renowned authors to speak to our community and share their valuable insights and passion for literature, science, research, and various disciplines. Titles will take over the Innovation Labs from Tuesday through Saturday. Our pop-up bookstore will feature children’s books along with traditional titles to serve as great holiday gifts. 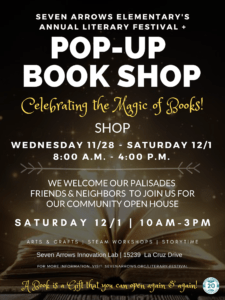 The Literary Festival culminates with a Community Open House Day, Saturday, December 1, where members of the Palisades community are invited to join our celebration of books, peruse our pop-up store, and register their children for FREE STEAM and Art activities. The activities are designed for children ages 5-18. Children under the age of 14 must be accompanied by an adult. The Literary Festival’s Community Open House is free to the public. We invite you and your friends in the greater Palisades community to be a part of our literary celebration!